Thai Coriander, Eryngium foetidum, is also known as Perennial Coriander, Mexican Corriander, Ngo Gai, Pak Chee Farang. Thai Coriander is a very popular culinary herb, the aromatic leaves being used as a spice and flavouring. The root and leaves are used as a Caribbean folk remedy for epilepsy, fevers and high blood pressure. 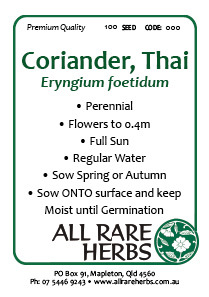 Thai Coriander is native to Central America and prefers well drained soils in a protected, sunny position. Drought and frost resistant. A perennial plant to 0.4m. Be the first to review “Coriander, Thai seed” Click here to cancel reply.